Here's Sitchy. He got his name from the Jersey Shore show. He's a broken black buck. He is an unshowable rabbit, all because he doesn't have a spot on his nose. 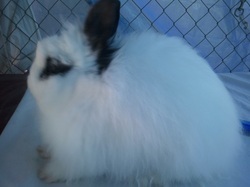 He is a great rabbit otherwise, and will definitely be bred. 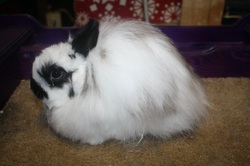 He also makes a wonderful showmanship rabbit, and he loves to go places and get attention. FOR SALE TO A GOOD LOVING PET HOME. I recieved this little guy in Red Bluff. He is going to help my herd SO much, cannot wait to breed this little guy!! Thank you Fuzzyville Rabbitry for helping me out!